Home Comic Books Agents of SHIELD Can HYDRA’s Cybertek Employees Argue They Acted Under Duress? 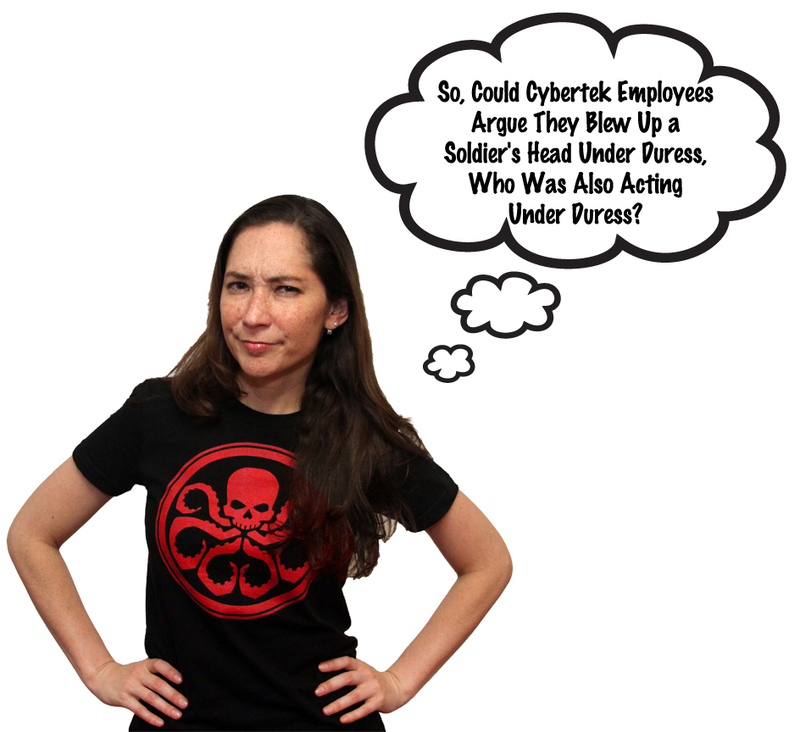 Can HYDRA’s Cybertek Employees Argue They Acted Under Duress? HYDRA Head John Garrett in the Agents of SHIELD season finale showed he truly had an organization with many heads. Cybertek, located in New Mexico, had employees who were acting as the handles for the soldiers with the explosive eye implants. These Cybertek employees provided instructions over a computer connect to the soldiers’ bionic eyes. In the event of non-compliance, the Cybertek employee could detonate the explosive eye-ball in a soldier. The Cybertek employees were a mix of “volunteers” (HYDRA) and those who joined for the “Incentive Program.” This program was code for kidnapping a loved one and threatening harm for non-compliance with a HYDRA order. Could the Cybertek employees argue they were operating under duress or the necessity defense? Could the soldiers in the field? What if the soldier killed someone or a Cybertek employee killed a soldier with his explosive eye? Both Cybertek employees and the soldiers could argue they were only do they actions under duress. And this could work, unless someone was killed by the direct actions of the defendant. Duress is the threat of harm made to compel a person to do something against his will. See, Black’s Law Dictionary App, 9th Edition. However, duress is a “defense as to all crimes except taking the life of an innocent person. . . .” McMillan v. State, 428 Md. 333, 351 (Md. 2012). No one at Cybertek who detonated a soldier’s explosive eye could argue the duress defense, because a defendant cannot kill someone and argue they murdered under duress. State v. Nieto, 129 N.M. 688, 694 (N.M. 2000). The same could be said for soldiers in the field who are killing innocents upon threat of their eye exploding. Cybertek employees MIGHT have a successful duress argue if they soldier they were providing instructions to, killed someone. In a case where a defendant was forced to participate in a robbery, and then those who caused the duress killed someone without the defendant’s involvement, the defendant could argue duress in those circumstances. McMillan v. State, 428 Md. 333, 351 (Md. 2012). Similarly, a Cybertek employee could argue that they were forced to provide assistance to HYDRA under duress and since they did not pull the trigger, they were not directly involved in murder. While there is no excuse for killing innocents to save one’s own life, there is a chance they could argue duress in those limited circumstances. Also a high chance it will fail. The soldier on the other hand who killed people would have no duress defense.